I am constantly doing research to find ways to get even better performance out of my clients to help them achieve their goals. 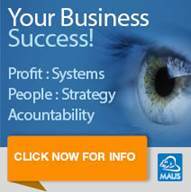 Recently I attended the 2009 Maus Business Systems Accredited Partners annual conference where we saw new products and research material to improve business efficiency. I have been working with Peter Hickey (CEO) since 1998 and through local and international affiliations I am using materials that have been developed to help successfully integrate services and effectively implement systems and programs developed based on years of research. 40% standard tax credit (the equivalent of a 133 %t deduction. Information on the Government Innovation Agenda, Powering Ideas – An Innovative Agenda for the 21st Century, is available at the department’s web site: www.innovation.gov.au. Support Line: 1800 77 7275. Adaptability is the ability to flourish and sustain high performance. It can be improved through conscious effort and creating a partnership with your mentor based on mutual trust and respect. Both people must realise they are comfortable enough within the relationship to be challenged and extended. This can form an unbeatable combination; a combination of enthusiasm, energy and innovation. In just 30 minutes discussing your most pressing problems, (free of charge) I can give you clarity on how to get your business back on track. Remember, I offer a money back guarantee to help you make every day more productive and more profitable. This entry was posted in Uncategorized on December 20, 2009 by .